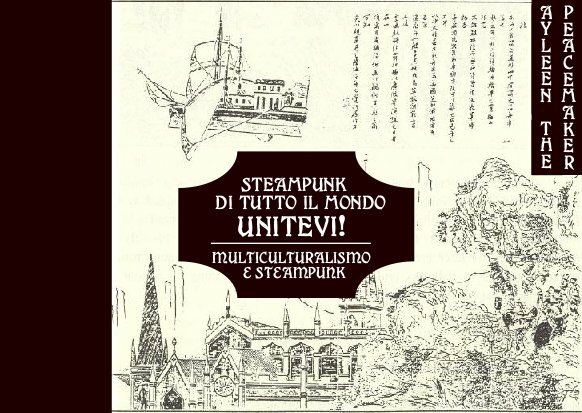 reginazabo, a blogger from Italy who works as a translator, was quite taken by my essay about the current state of multicultural steampunk and translated it into Italian to share with the steampunks of Italy! A PDF of this document is available through the DIY magazine Ruggine (“Rust”). Our funding principle is Do-It-Yourself. We find things we like and simply activate to spread them around. It’s all about putting our hands on the heart of the matter, of getting involved with our brains, blood and hearts and avoiding the detached vantage points from which others gaze at futures made by someone else. A giant THANK YOU goes out to her and the Ruggine team for their work in putting this together! Available in Italian from Ruggine magazine. Click to download PDF. Formatted at 52 pages in a pocket-sized edition, this PDF prints to the ideal size for stuffing in your waistcoat before leaving for your next steampunk meet-up, or ready-made for the determined pamphleteer. “Steampunk di tutto il mondo, unitevi!” is also available to read on reginazabo’s blog (at Part #1 and Part #2).